San Puri first experienced the Civil Service as part of the Summer Diversity Internship Programme and has now joined the Fast Stream, which offers an accelerated path to leadership in the Civil Service. 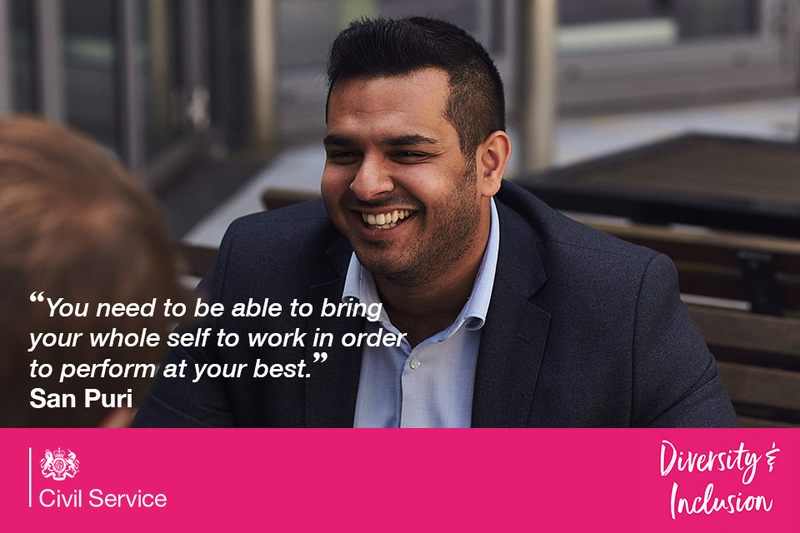 At the launch of the Civil Service Diversity and Inclusion Strategy, we asked San for his views on the importance of inclusion at work and being part of a diverse Fast Stream. Why not find out more about joining the Fast Stream? Why is having an inclusive environment at work important? You need to be able to bring your 'whole self' to work in order to perform at your best. You need to feel comfortable and valued. An inclusive work environment is one of the first and most important steps to bringing your whole self to work. A workplace – in the Civil Service or outside – should not only be inclusive of difference, whether this be age, background, sexual orientation, gender, disability and so forth, but should also draw on and celebrate difference. How was your introduction to the Civil Service on the Summer Diversity Internship Programme? It was inspiring. I heard from and met so many influential people from a multitude of backgrounds, some who I am still in touch with almost 3 years later. I met the Fast Stream team at a careers fair, and having studied politics at university I wanted to understand how the Civil Service and public policy work. During the internship I had the opportunity to work on some high- profile projects. Would you encourage others to apply to join the Fast Stream and why? I really recommend you apply if you are eligible! Aside from the fact that the opportunities and experience you get on the Fast Stream are second to none, I would encourage people to apply to the scheme due the Fast Stream team’s willingness to embrace change. The results and recommendations of the Bridge Report [an analysis of Fast Stream diversity] were grave: there was a serious deficit of people from lower socioeconomic backgrounds joining the Fast Stream. Rather than being phased by the recommendations, the team began implementing serious change to the assessment process to increase diversity. This included opening a new assessment centre in Newcastle, so that people don’t have to travel to London from the north – rightly so! I am a firm believer that the Fast Stream is modelling best practice, and for that reason alone I encourage people to apply. How well do you think the Civil Service does on diversity and inclusion? If I look at the Civil Service departments I have worked in since joining the Fast Stream, we are doing quite well at reflecting the make-up of the population we serve (and much better than a lot of other corporations). I still think more work needs to be done to make sure that the demographic of our senior leaders is representative, and it would be good to see more senior role models from minorities and lower socioeconomic backgrounds. The new Civil Service Diversity & Inclusion Strategy is a big step in the right direction. Can you suggest a way that everyone can make their workplace more inclusive? 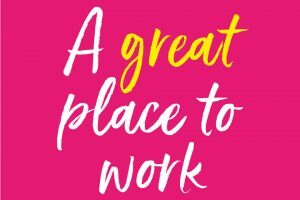 Making sure the a workplace reflects the people you serve is important, but the next step is really embracing difference: encouraging employees to share their personal experiences and building understanding of different cultures and backgrounds. People have to really believe that inclusion is important, and showing them the benefits of it is a great starting point. Thank you San for a great read out on your experience. Having been in the Organisation over 26+ years, I feel that we are a far more Diverse and Inclusive Organisation and that we should seek to do more to promote this! Congratulations. You rightly point out that “the opportunities and experience you get on the Fast Stream are second to none” - unfortunately for majority of us the reality of development and opportunities is just none, as we are crushed by the very low glass ceiling. Managed moves to fill a CV, and the ancillary benefits such as confidence, are distant dreams to those who struggle to even get what they do, however excellent, recognised. How much longer are we expected to be comforted by those in a position of privilege telling us what a great situation we are in as we are ground down by the constant promise of better times to come. Race relations, not solved, morphed into Diversity then, when the paucity of the required action begins to show, morphed again into diversity and Inclusion. The fact is that the civil service reflects a society that is segmented by race and privilege with no imperative to change. No one over 15 years old needed the Lammy report to point out the unequal treatment of black men, in particular, in Britain. Without a clarification of the distinction no peaceful solution can ever be found. The constantly “iniquitous “promotion” structure which has been abused over many years and which is now more open to abuse than ever. It has always been possible to promote people without recourse to the system – in one case in 5 days start to finish. I have considered that perhaps I was simply not good enough or misunderstood the situations however the skill I honed in private industry and brought to the civil service together with subsequent achievements should have at least suggested potential to develop. Without amazing foresight by those choosing talent potential can be nurtured but cannot be guaranteed. The benefits of early privilege however are everlasting, particularly as it is human nature to support the status quo and not to admit errors that have emotional attachment. Just to be clear I am not so naïve as to think my opinions will be an impetus for change but to paraphrase Clint Eastwood,” don’t tinkle down my back and tell me it’s raining”.